I’m looking forward to Father’s Day. Plans aren’t formalized yet, but I’ll likely cook a nice meal and get together with family and friends. I anticipate a day celebrating the good men in my life. My husband, Ed, is an awesome husband and Dad, and I’m sure my girls will honor him well. My daughter and son-in-law will bring over that wonderful grandchild. We’ll get to see Ed again in fine form as both Dad and Grandpa. Then, when the hoopla is over, I’ll settle in and think more deeply about the day. Amidst being thankful for the good men in my life, a few painful thoughts will predictably surface as they have for 25 years now. 1990 seems so long ago. Though the uncomfortable thoughts get a little easier every year, I have grown to accept that I will, once again, feel a little sting at the end of Father’s Day. I accept the fact that I am one person who will feel a touch of mixed emotions on Father’s Day. It’s not that I want to deny fathers the respect these men certainly deserve in our world. It’s just that no one seems to acknowledge that it can be emotionally difficult for those of us who had less than perfect relationships with our fathers. Or those for whom the day was marked by death or some other tragedy. 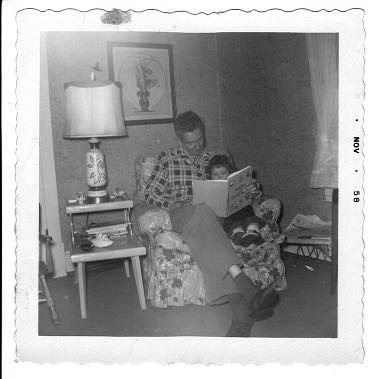 Try as I may to remember good Father’s Days in my childhood, I can’t remember being the little girl who gave my father a cute card, or made him breakfast, or celebrated with family over a cake and ice cream. And, as much as I try to forget it every year when I pick out a card for my husband, I can’t help but remember the years of searching through the Father’s Day card racks for a something that would be kind but a little more honest. It always took awhile to find a card that simply said, “I love you” without that “You’re the best Dad in the world” line. I really don’t want to think about Father’s Day 25 years ago, but I know I will. In 1990, after a wonderful, family celebration of my Father-in-law, that day I went to visit my father in the VA hospital. I was greeted by a nurse who told me he was unresponsive. It took awhile for me to catch on. A few more words, and it finally sunk in that he was dying. How could he be dying on Father’s Day? It just added insult to injury. In the moment, it seemed like there was a lot to say in a very short amount of time. “Talk to him. He may be still able to hear you”, the nurse encouraged. I mustered up all my courage and managed to put aside the past without the Father’s Day card accolades. I just told him I loved him. In the moment , it didn’t seem important if he actually heard me or not. Today I am truly happy for my friends who celebrate Father’s Day with all of Hallmark’s phraseology. But I also join with my brothers and sisters whose Father’s Day is tinged with less comfortable emotions like grief, loss, anger, and/or sadness. Such mixed emotions make you feel a little crazy until you get used to it. I’ve come to understand that it is often healthy to hold seemingly contradictory emotions and simply accept your life. You’ll never find this on a Hallmark card, but some of us realize that some ambivalence is required to live authentically. And it doesn’t have to spoil your day.